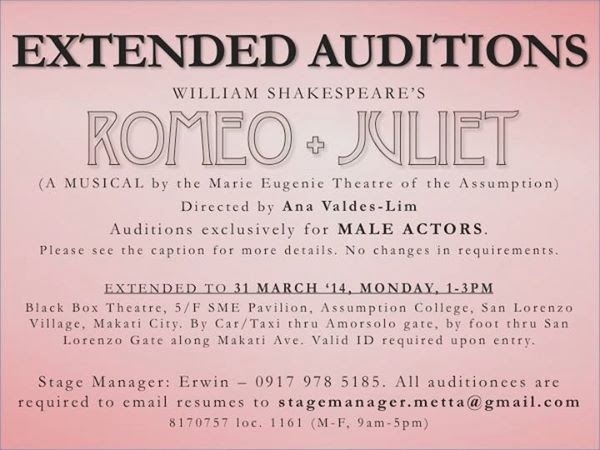 Marie Eugenie Theatre of the Assumption (METTA), the resident theater organization of Assumption College San Lorenzo, has extended its open audition for their upcoming musical project, William Shakespeare’s ROMEO + JULIET. This audition is open only to male roles. Ana Valdes-Lim directs this production. Prepare: One (1) Dramatic Monologue, 1 min. One (1) Comedic Monologue, 1 min. One (1) Movement or Dance, 1 min.